A cornu or cornum (Latin: cornū, cornūs or cornum, "horn", plural cornua, sometimes translated misleadingly as "cornet") was an ancient Roman brass instrument about 3 m (9.8 ft) long in the shape of a letter 'G'. The instrument was braced by a crossbar that stiffened the structure and provided a means of supporting its weight on the player's shoulder. Some specimens survive in the archaeological record, two from the ruins of Pompeii. The cornu may be difficult to distinguish from the buccina. It was used by the Roman army for communicating orders to troops in battle. 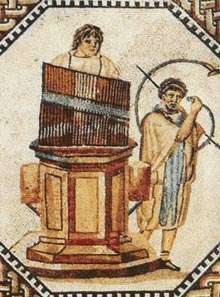 In Roman art, the cornu appears among the instruments that accompany games (ludi) or gladiator combat in the arena, as on the Zliten mosaic. The cornu was carried by the cornicen (horn-blower) who coded the general's orders into signals and broadcast them over the field during battles. The Roman army also made use of a straight trumpet called a tuba, which bore no resemblance to the modern tuba. The music of the legion consists of trumpets, cornets and buccinae. The trumpet sounds the charge and the retreat. The cornets are used only to regulate the motions of the colors; the trumpets serve when the soldiers are ordered out to any work without the colors; but in time of action, the trumpets and cornets sound together. The classicum, which is a particular sound of the buccina or horn, is appropriated to the commander-in-chief and is used in the presence of the general, or at the execution of a soldier, as a mark of its being done by his authority. The ordinary guards and outposts are always mounted and relieved by the sound of trumpet, which also directs the motions of the soldiers on working parties and on field days. The cornets sound whenever the colors are to be struck or planted. These rules must be punctually observed in all exercises and reviews so that the soldiers may be ready to obey them in action without hesitation according to the general's orders either to charge or halt, to pursue the enemy or to retire. For reason will convince us that what is necessary to be performed in the heat of action should constantly be practiced in the leisure of peace. The cornu was revived as the "tuba curva" during the French Revolution, along with the buccin. Both were first used in music that François Joseph Gossec composed for the translation of the remains of Voltaire to the Pantheon, on 11 July 1791. ↑ Thomas Wiedemann, Emperors and Gladiators (Routledge, 1992, 1995), p. 15.